I have to admit, I was never keen to go to Nepal. On reflection, I guess it was a bit of ignorance. Perhaps ignorance is my biggest secret. I knew nothing about the country, the culture or the people, and for some reason I had no great desire to find out. As soon as I set eyes on Kathmandu I was in complete awe of its natural, quirky beauty. This place was no standard, big city. It wasn’t terribly busy, wasn’t terribly noisy and wasn’t terribly dusty or rowdy as I had expected. The narrow streets intertwined, filled with busy markets and crumbling temples and the air was infused with the thick fragrance of jasmine. People smiled gently and whispered Namaste as we passed them in the streets. The city was vibrant and colourful, an eclectic mix of modern café culture and beautiful ancient temples and crumbly buildings. On the horizon something special caught my eye, my first glimpse of the Himalayan mountain range was simply breath taking, a fairy-tale like beauty sparkling beyond the city. Every morning started with the hope of crisp, clear skies and many started on rickety buses. Icy, cold and damp and the roads winding and bumpy. The long journey to Pokhara was certainly not boring. Driving around snowy topped mountain roads and along milky river banks I quickly came to realise that Kathmandu was just the gateway to this fascinating and stunning country. Every morning debating whether it was clear enough to make the journey, the stunning Annapurna mountains glistened at the end of the road. The day we made the journey to the lookout point was perfect, running against the clouds before they dropped too low, we made it. 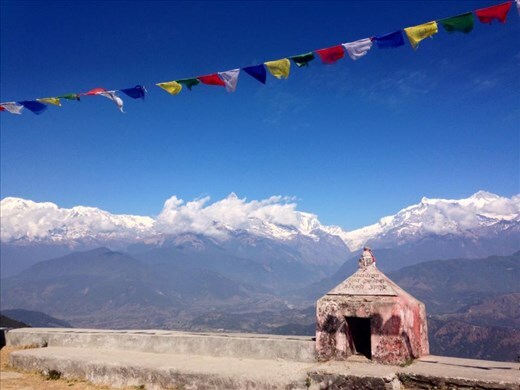 The snow topped mountains twinkled against the blue skies whilst the Nepalese locals took their morning offerings to the temples and got on with their daily chores. The sparking mountains, the mirror like lake, colourful temples and delicious Nepalese delicacies made this place so simple and beautiful. A visit to Nepal wouldn’t have been complete without a spiritual visit to Lumbini, Birthplace of Buddha. I’m not a Buddhist myself, infact, I am not what you would call a religious person. I am however, free minded and insanely curious. The do say that an open mind is a learning mind. Buddhism is something that intrigues and interests me, something I’ve always been keen to learn about. The birthplace of the Buddha was not glamorous, a fine way to describe it would be run down and in a pretty filthy town. However, understandably Lumbini is a very important place for Buddhists to visit. I took the opportunity here to briefly talk with and be blessed by a Monk (when in Rome and all that..) Personally I thrive on these opportunities to learn and explore new cultures. For me it is important to have an open mind, face my fears, destroy any ignorance and obtain a victory over myself. Most of our days in Nepal were spent walking and absorbing the stunning landscapes, mountain views, watching sunsets over the lake and boats in Pokhara, mooching around ancient towns and temples and climbing hills to pretty Pagodas, paragliding over the Annapurna mountain range, flying over Everest and eating Mo-Mos. Nepal completely exceeded all of my expectations. My knowledge about the culture, Hinduism and Buddhism soared and my memories full of the welcoming people and beautiful scenes I had witnessed over my last 3 weeks in such and inspiring and surprising country. Namaste: “ I honour the place in you in which the entire universe dwells, I honour the place in you which is of love, of truth, of light and of peace. When you are in that place and we are sharing these things, we are united, we are the same, we are one”.